1.Viewing installation video ,please search ID: bsa6hp5yOX8 on YouTube or contact us get installation link. 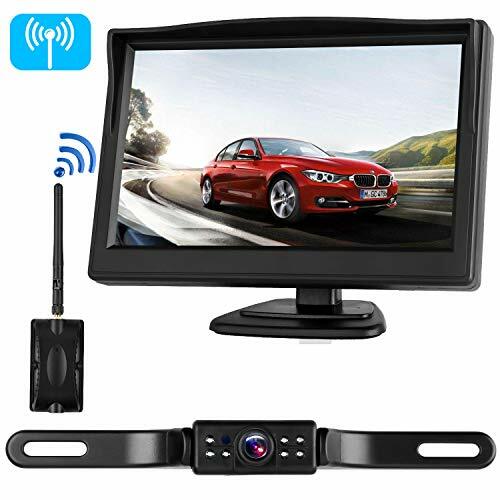 2.The wireless backup camera system suit for Car/SUV/MPV/Pickup/Truck/Trailer/5th Wheel/Motorhome/BUS/Campers/Van/RV etc. 3.Digital signals No flicker and without interference ,stable and super strong signal,can working under 80ft vehicle, and over 600ft on the empty field . 4.Intelligent switch can on/off guide lines, switched mirrored/facing view makes the backup cameras can used for front facing camera. 5.You can adjust the screen brightness by the switch by youself. 6.Very easy installation ,and there are two types of installation . 7.The newly upgraded IP68 waterproof system with 150 degree wide angle. 8.No color difference. The color you see on the screen is the same as the real color. 2 x screws + 2 x 3M Sticker + 2 x Magic straps for fixing the Transmitter. A intelligent switch with 10 functions included ，on/off reversing guide lines,switching from rear view/front facing view/side view. Adjusting the width/length/downward angle for guide lines.It makes compatible various size of vehicle. Very easy to install.The base can be disassembled, it can be installed directly on the flat panel, or it can be installed on the windshield(Windshield suction cup mount was provided).You can choose either method by yourself. No flickers and Interference Under 80ft Vehicle,suitible for Truck/Trailer/Camper/SUV/Van/5th Wheel/RV/Car etc.IP68 waterproof with 150 degree viewing angle, 7 LED IR Lights night vision view clearly at night.Upgrade to color HD quality without color difference. The backup camera system with 5 inch monitor.Connecting backup camera to reverse lights for reverse use, or connecting to running lights/12v battery for continuous use.You can view installation video by search video ID bsa6hp5yOX8 on YouTube or contact us get link .